I can not stress enough how much I love this place, only a couple hours south of the busy crowds in Cancun a paradise called Tulum awaits. 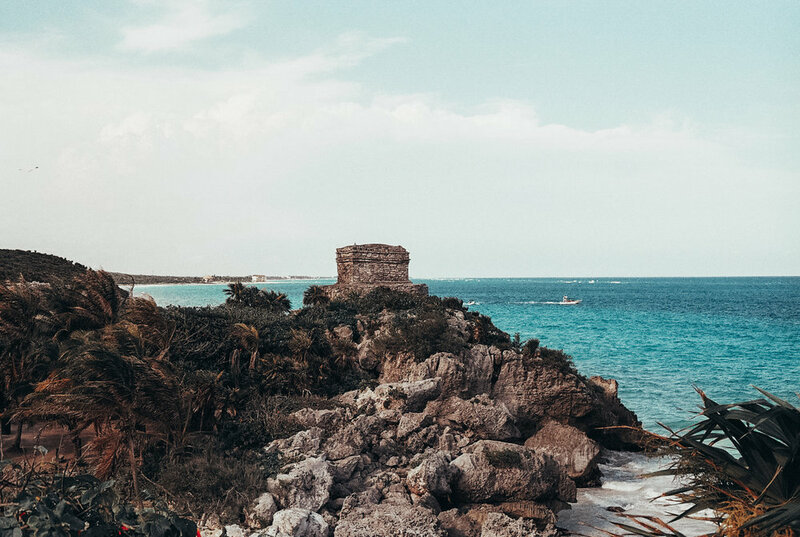 We went for a about a week and got to explore Playa del Carmen, Akumal, Cenotes around the area, the Sian Kaan Biosphere, The Tulum ruins, the town and much more. There is so much more to do and check out that I can not wait to go back! Right off the plane we drove to a little beach called Puerto Morelos and had the most delicious whole fish with salad and rice! We absolutely adore sea food so it was the perfect first meal for us. The first night we stayed in Playa del Carmen at a lovely airbnb that highlighted the mayan culture. The next morning we woke up and had Mexican breakfast on the beautiful garden. Later that day we explored the most popular areas of Playa like "5th ave". We had lunch on 5th avenue (tacos and micheladas) and after headed down towards Tulum. We stoped at Centote Jardin del Eden, which means garden of eden so you can already imagine how magical it was just by the hearing the name. We had heard of Tulum and how it had blown up in the past 5 years but let me tell you, you don't really know until you get there, its so trendy and cool but it makes you feel right at home the second you get there...in a good way. However we wanted "the local experience", authentic mexican experiences and food so we chose every place we stayed and ate at very carefully, purposely trying to stay away from the touristy crowd that you find at the eco chic resorts. We wanted to enjoy the simple things like, 35c tacos in the middle of town at Antojitos La Chiapaneca hands down the best and most authentic tacos in town, the beautiful sunrises/sunsets on the emptier beaches, walks around town, and bike rides to our favorite breakfast/lunch spots. In Tulum we stayed at Los Amigos, it was so beautiful, comfortable and had a skylight on top of the bed to fall asleep watching the stars and the moon. It was very cute and they even offered morning yoga on their rooftop pool patio, where we found ourselves hanging at most mornings. It's so easy to ride a bike around Tulum so most airbnb's provide you with bikes. We loved riding our bikes to lunch at the beach, one of the first places we ate at was Mezzainine an awesome restaurant/hotel on the beach with delicious margaritas, tacos and the best view! Other places to check out for lunch are Ziggy Beach Restaurant, the tacos here were also great and the swings on the bar were super fun, a cute place to come have a drink by the beach during the day and a yummy lunch. El Camello Jr. a place for ceviche that was recommended to us by the locals( as every Peruvian, I adore ceviche and this place did not disappoint). Natural Juice, the yummiest smoothie and juice place. Raw Love, perfect for smoothie bowls and healthy gluten free and venga food. For dinner we checked out Hartwood an amazing seafood and mexican grill restaurant. Mur Mur my personal favorite which we stumbled upon by accident, we went here the night of our anniversary and had a very cute/romantic and delicious meal. I loved the grilled octopus, ceviche and roasted beets. We were actually on our way to Arca but it was their anniversary so the kitchen had closed early for a party(which we went to after dinner and it was soo fun, house music all night). We also ate dinner at Arca another night. Kitchen Table was one of our last dinners, also delicious and very unique. Every place we ate at was amazing! One of my favorite things about traveling is trying all the food I can possibly eat haha. Another cool place to check out is The Tulum Ruins, it gets super touristy though but luckily we went early and it wasn't as crowded. The ruins site is pretty cool considering they are the only ruins in the world with beach access. The beach is pretty breathtaking from the cliffside and once you get down you get to take a dip in the turquoise water if you'd like. The Sian Ka'an biosphere was also an awesome gem to check out, there are a couple tours you can do but we did the mayan canal (floating one) since it was recommended by some locals we met over margs and tacos hehe. You arrive at this beauitful turquoise lagoon and they take you on a boat ride to the canals where they drop you off with lifeguard vests and they tell you to put them on as diapers...yes you read right diapers hahaha it was sooo much fun though! You floated through the crystal clear canal sorta sitting down and very comfy. A beautiful and super fun experience. It was on the pricier side compared to everything else we did but soo worth it! Swimming with giant turtles on Akumal beach was a dream come true! I had snorkeled before in Colombia but never like this time. Again we managed to go when the tourists weren't around as recommended by our local friends. When you arrive to the beach you will get tons of tour guides trying to offer you tours of the reef and what not. I recommend to do it on your own if you have snorkeled before. You can rent the snorkel gear for a small price and go snorkeling on your own time. The area where you're supposed to snorkel is sorta fenced but of course we passed the fence and snorkeled around a beautiful reef where we end up seeing more than turtles. Its amazing all the mysteries the ocean has, it was scary yet beautiful at the same time. If you plan to snokel a lot though I recomend bringing your own gear which you can get here for a small price. For night life/ going out we absolutely fell in love with Papaya Playa Project, the house music vibes and the beach club exceeded our expectations. We went to their infamous Full Moon party which lasted until sunrise. Such a magical night with my lover I would not change it for the world! That is it for Tulum for now, our stay was short but definitely beautiful. This will forever be our little romantic escape from NYC. 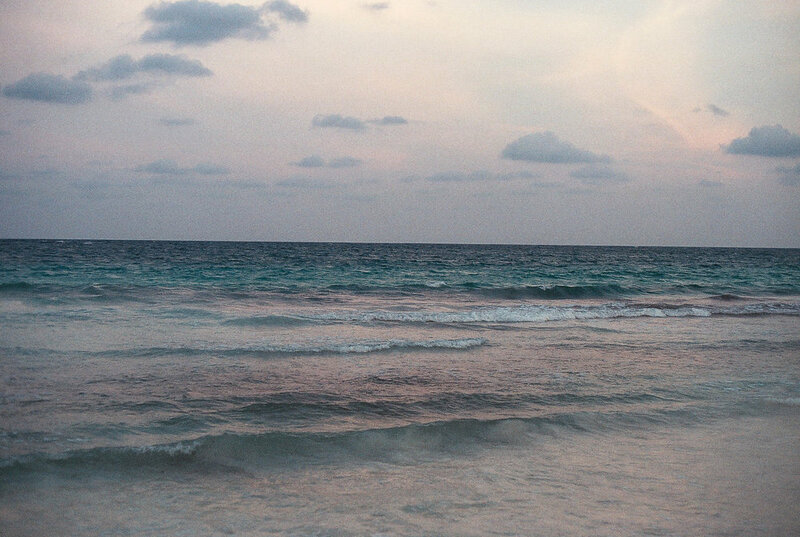 See you soon Tulum, can't wat to explore your magical beaches, delicious food, and fun parties soon again. No puedo enfatizar suficientemente cuánto me encanta este lugar, sólo un par de horas al sur de la bulliciosa multitud de Cancún un paraíso llamado Tulum está a la espera. Fuimos solo una semana y pudimos explorar Playa del Carmen, Akumal, Cenotes alrededor del área, la Biosfera de Sian Kaan, las ruinas de Tulum, la ciudad y mucho mas. Hay mucho más para hacer y ver que no puedo esperar para regresar! Apenas salimos del avión fuimos a una pequeña playa llamada Puerto Morelos a comer el pescado mas delicioso con ensalada y arroz recomendado por las personas que trabajaban en el lugar donde rentamos el carro. Nosotros adoramos la comida de mar, por lo que fue la primera comida perfecta para nosotros. La primera noche la pasamos en Playa del Carmen en un precioso airbnb que ponían de relieve la cultura maya. A la mañana siguiente nos despertamos y había desayuno mexicano en el hermoso jardín. Mas tarde exploraramos las áreas más populares de playa como "5th ave". Almorzamos en 5th Avenue (tacos y micheladas) y después nos dirigimos hacia Tulum. Paramos en el Centote jardín de Edén, solo con el nombre pueden imaginar cómo era de mágico y bello. Habíamos oído hablar de Tulum y lo mucho que habia crecido los últimos 5 años, pero déjenme decirles que no se sabe de lo que hablan hasta llegar allí, tan moderno y fresco y que te hace sentir como en casa el segundo hay que llegas en buena forma. Sin embargo, queríamos que la experiencia sea como la de una persona local, auténticas experiencias mexicanas y rica comida, así que elegimos cada lugar en el que nos alojamos y comimos muy detenidamente deliberadamente tratando de permanecer lejos de las multitudes turísticas que puedes encontrar en los eco resort chic. Queríamos disfrutar de las cosas simples como tacos a 35c de dollar en un lugar llamado Antojitos La Chiapaneca que pongo mis manos al fuego el lugar más auténtico y delicioso de tacos en el pueblo, los bellos amaneceres y puestas de sol en las playas más vacías, caminatas por el pueblo, y andar en bicicleta a nuestros lugares favoritos de desayuno/almuerzo. En Tulum nos alojamos en Los Amigos, era lindo, cómodo, acogedor y tenía una ventana en el techo encima de la cama para quedarse dormido viendo las estrellas y la luna. Super cute e incluso ofrecian yoga en las mañanas en el techo junto a la piscina, donde nos encontramos haciendo yoga la mayoría de las mañanas. Es tan fácil de montar en bicicleta alrededor del pueblo que la mayoria de airbnb's te ofrecen bicicletas. Uno de los primeros lugares donde almorzamos fue Mezzainine un lugar en la playa con linda atencion, deliciosas margaritas, tacos y la mejor vista! Otros lugares para chequiar para el almuerzo o desayuno, el restaurante de playa Ziggy, los tacos aquí también fueron ricos, y los columpios en el bar eran súper divertidos. Un lindo lugar para venir tomar una bebida junto a la playa durante el día y un delicioso almuerzo. El Camello Jr. en el pueblo recomendado para el ceviche, que nos fue recomendado por los lugareños, como toda peruano amo el ceviche y este lugar no me decepciono. Natural Juice, ricos jugos y smoothies. Raw Love, perfecto para el smoothie bowls y comida saludable. Para la cena nos ecanto Hartwood, restaurante de mariscos y Mexican Grill. Mur Mur, unos mis favoritos que nos topamos por accidente, fuimos aquí la noche de nuestro aniversario y tuvimos una muy linda/romántica y deliciosa comida. Me encantó el pulpo a la parrilla, ceviche y beterraga asada. En realidad estábamos en camino hacia Arca, pero era su aniversario, así que la cocina había cerrado temprano para un una fiesta(que fuimos después de la cena y la pasamos super chevere, house music toda la noche). También cenamos en Arca otra noche. Una de nuestras últimas cenas fue en Kitchen Table que también estuvo increíble. Una de mis cosas favoritas sobre viajar es probar toda la comida que pueda comer jaja. Otro lugar lindo para la chequiar es las ruinas de Tulum, se pone super turístico pero afortunadamente fuimos temprano y no estaba tan busy. Las ruinas estan ubicadas en un lugar muy lindo, considerando que son las únicas ruinas en el mundo con acceso a la playa. La playa es bastante impresionante desde el acantilado y una vez que bajas te puedes dar un chapuzón en las aguas turquesas. La biosfera de Sian Ka'an fue otro lugar bello para chequiar, hay un par de tours que se puede hacer pero nosotros hicimos el canal maya, ya que fue recomendado por algunos lugareños que conocimos sobre margaritas y tacos jeje. Llegas a esta hermosa laguna de color turquesa y te llevan en bote a los canales donde te dejan con chalecos salvavidas y te dicen que te los pongas en forma de pañales...sí leyeron correcto pañales jajaja la pasamos super. Flotamos y nos relajamos a través del canal de agua cristalina medios sentados. Una hermosa y super divertida experiencia, fue lo más caro que hicimos comparado con lo demas pero vale la pena! Super recomendado. Aprendes un poquito de historia y te relajas. Nadar con tortugas gigantes en la playa de Akumal fue un sueño hecho realidad! Habiamos hecho snorkel antes, pero nunca como esta vez. Cuando llegas a la playa toneladas de guías turísticos se te acercara intentando ofrecerte tours del arrecife y otras cosas que no necesitas. Recomiendo que lo hangan por su cuenta si han hecho snorkel antes. Pueden alquilar el equipo de snorkel por un precio reducido y bucear en tu propio tiempo. El área donde se supone que tienes que bucear es medio vallado pero, por supuesto, pasamos las vallas y nadamos alrededor de un hermoso arrecife donde terminamos viendo más que tortugas. Es asombroso todos los misterios del océano, me daba un poco de miedo pero era tan bello al mismo tiempo. Si planean ir y hacer snokel mucho les recomiendo llevar su propio equipo que lo pueden obtener aquí por un pequeño precio y ya queda para todas las vacaciones. Para la vida nocturna y fiesta nos estuvimos en amores con Papaya Playa Project, la música era house jaja para variar y las vibras en el club de playa superó nuestras expectativas. Fuimos a su infama fiesta de luna llena que duró hasta el amanecer. Esa noche fue tan mágica con mi chico lo no cambiaría por nada en el mundo! Eso es todo sobre Tulum por ahora, nuestra estancia fue corta pero definitivamente hermosa. Este siempre será nuestro pequeño escape romántico de Nueva York. Nos vemos pronto Tulum, no puedo esperar para explorar tus playas mágicas, comida deliciosa y divertidas fiestas pronto otra vez.